All seven of our Northwest Ohio locations are dedicated to the maintenance of your vehicle. We use only the finest in car care products, formulated for optimum performance and protection of your vehicle. From our "Magma Shine" deep-cleaning process to our high-tech polymer "Magma Seal Protectant" and "Underbody Salt Shield" your exterior surfaces will not only shine, but be protected as well. Marathon Fuels at our Defiance Wash-n-Fill location. 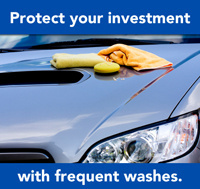 State-of-the-art soft cloth equipment to gently clean your vehicle. Vacuums at all of our locations. Convenient payment methods including cash and all major credit cards. All washes open 7 days a week,please visit our locations page for individual store hours. Buy a "Wash Card" and SAVE! Click here for details. Cleans the underside of your vehicle to remove salt, sand and any other contaminants. Special formulated cleaner with solvents and wetting agents to break the bond that holds brake dust and other oily dirt to the wheels. Increases the shine on chrome and alloy wheels. Rich foam formulated with a combination of cleaning agents and brighteners to enhance shine and protection. Treat your vehicle. A premium combination of hard shell carnauba wax and advanced silicones that bond on contact that leaves a lasting shine and protection to your vehicles surface. Dirt and salt have no where to hide. This application helps to remove the corrosive effects of magnesium and calcium chloride from a vehicle’s undercarriage, A must in the winter time! For hard to remove, damaging brake dust and increased shine on chrome & alloy wheels.